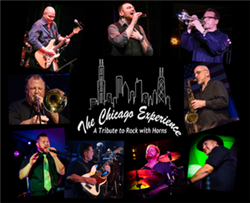 The Chicago Experience is a group of local musicians performing songs from one of the longest-running and best-selling groups of all time, Chicago. Featuring three lead vocalists, a smoking rhythm section and the area's hottest horns you can expect a powerful set focused on the early years, especially Chicago’s first two records, 1969’s “Chicago Transit Authority” and the 1970 self-titled album, which features songs like “Beginnings,” “Questions 67 and 68” and “Does Anybody Really Know What Time It Is?” As well, the band will include a few deep album cuts fans who remember a time when we listened to entire albums. Whether you've heard these songs or not, they are performed with enough passion and precision to make you an instant fan. The Chicago Experience will satisfy the doubts of even the most critical listener with their faithful tribute on September 15th at Pheasant Run Mainstage Theater. The Chicago Experience also had the honor of playing with Chicago’s original drummer Danny Seraphine and Bill Champlin, who sang and played keyboards and guitar for Chicago for more than 25 years. The current members of Chicago Experience also have performed with classic Chicago-based bands like The Buckinghams, The Ides of March and The Cryan’ Shames. The acoustic act opening the night for us is the Dennis O'Brien trio.